A 39-year-old operator of a press brake at a metal fabrication facility died from head and chest trauma when he was struck by ejected steel in January, 2005. This incident acted as a catalyst for heightened safety regulations by the OSHA (Occupational Safe and Health Administration). Over the years since then, presence sensing devices or various types have become more and more prevalent for safeguarding machines even though they must be inspected on a case by case basis in order to be approved. Every presence sensing unit must be approved by a Nationally Recognized Testing Laboratory (NRTL), but if and when it is approved, presence sensing devices are convenient for the operator (especially when compared to wrist restraints) and effective. This is a discussion of some of the most important factors in selecting and implementing a presence sensing device for safeguarding a press brake. In other words, the operators hand must not be able to move faster than the protective response of the safeguard. If their hand could potentially move faster, the machine could still be dangerous to operate. Stop distance times are determined by the operating speed of the press brake. Machines also must adhere to a speed limit that depends on their specific function. In accordance with the standard, if stopping speed isn’t automatically monitored, a stop test must be done once every four hours during machine operation. 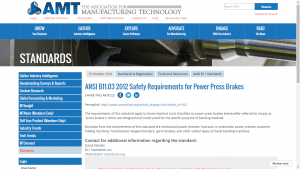 OSHA safety regulations and the ANSI B11.1-2012 press brake safety standard detail formulas for calculating safety distance. Light curtains operate from each side of the press brake bed, and cast infrared beams on the work area. The presence of beams or an invisible light curtain can create difficulty to operate, especially if a variety of jobs are to be accomplished daily. This may result in what’s called “muting abuse,” by an operator who prefers to work unhindered. However, the beams or curtain can be programmed to automatically mute in rhythm with the cycle in a way that may not hinder the process. While the ram is open less than 0.25 inches, it is normally not possible for the operator to access the point of operation, even when working with very small objects. But special modes can be programmed and initiated that take into account tasks requiring work in close proximity to the die and mechanical obstructions. As long as the operator’s hands are clear by at least 4 inches during the moment of contact, this can be done. Nonetheless, the spot directly below the punch tip ±2.5 mm from the centerline must continuously be safeguarded under all circumstances. It should be noted that beams and light curtains used as close proximity safeguards are only effective on units that are even or level enough to accommodate them. If tools or portions of the unit are dissimilar in height, the beam may not be able to reach to, or beyond, the point of operation in a manner that satisfies regulations.